"Me and Kid Durango, that's who! I mean, Kid Durango and I." 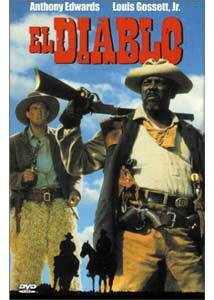 Stars: Anthony Edwards, Louis Gossett, Jr.
El Diablo stars Anthony Edwards as Billy Ray Smith, a milquetoast teacher in the Wild West who takes it upon himself to rescue his pretty student Nettie Tuleen (Sarah Trigger) when she is kidnapped by the handsome bandito El Diablo (Robert Beltran). His efforts come to no avail until he meets the imposing Van Leek (Louis Gossett, Jr.), a gunfighter and all-around tough guy who rounds up his disreputable buddies to help Smith out�providing they all get a cut of El Diablo's gold. It's apparent that this 1990 made-for-cable HBO movie has only found its way to DVD because it stars Anthony Edwards, currently of E.R. television fame. The film itself has little to recommend it�it's a western comedy in the vein of Support Your Local Gunfighter, The Shakiest Gun in the West or Lust in the Dust, though its quality is more akin to Wagons East, John Candy's lamentable last film, also helmed by director Peter Markle. The jokes consistently fall flat�one running gag involves Smith's tendency to shoot his own horses, and many supposed jokes turn on obvious stereotype inversions: Smith's idol "Kid Durango" (Joe Pantoliano) turns out to be a British writer with a vivid imagination, Nettie thrives under El Diablo's sexual tutelage, and "The Preacher" (John Glover) is greedy and immoral. Quelle surprise! I'm really hard-pressed to say anything positive about this effort. One gets the impression that the script, co-written by John Carpenter (Halloween), sat on the shelf until Carpenter and his regular co-producer Debra Hill decided to dust it off for HBO. The on-location Western photography is occasionally quite attractive, and some people might find it a mildly amusing way to spend 108 minutes (yes, it's also too long). But it doesn't add up to much at all, and there are many better comedy/western choices available on DVD. Image Transfer Review: HBO presents El Diablo in anamorphic 1.78:1 format, apparently cropped down from a 1.33:1 made-for-television original. The cropping isn't too noticeable in many scenes, but credits that sit right at the bottom edge of the screen and heads that are "cut off" at the top edge betray the artifice. On the one hand, it's good to know that HBO values anamorphic widescreen; on the other, imposing a "widescreen" transfer on a full-frame production violates every tenet of Original Aspect Ratio preservation. The transfer is otherwise presentable, slightly soft with significant edge-enhancement and some grain clouding, but details look sharp enough up close. The cropping is awkward, though, and brings this grade down significantly. Audio Transfer Review: El Diablo retains its original English Dolby 2.0 Surround audio, with a monophonic Spanish dub as an alternate track. The film's corny, "comic" western music and dialogue come through reasonably well, but there isn't much bass to speak of, and the dynamic range of the television-oriented soundtrack is extremely compressed throughout. Passable, but far from impressive. Extras Review: HBO supports El Diablo with 14 picture-menu chapter stops, trilingual subtitles, and cast and crew information. Biographies and filmographies are provided for Anthony Edwards, Louis Gossett, Jr., John Glover, director Peter Markle, and writer/producer John Carpenter; co-writers Bill Phillips and Tommy Lee Wallace get filmographies only. Ain't nothin' more to see here, greenhorn. El Diablo is a relic of days gone by, a "comedy" that never gets out from under its stale jokes and western clich�s. HBO's DVD presents the made-for-television movie in a cropped 16:9 aspect ratio that seems driven more by marketing than aesthetics, and the film never finds its footing. I can't recommend this one.